When Golden Age fans and historians think of that venerable Golden Age publisher T. T. Scott’s Fiction House line of comics (certainly one of the more successful comics lines of the era, running from 1938 until 1954), they think of a lot of great comics- science-fiction, jungle, aviation and adventure, all with a strong “Good Girl” art slant. What they DON’T think of is costumed supercharacters. But- Fiction House DID give the superhero bandwagon a few turns (particularly early on), and the uninitiated will be surprised to learn that they weren’t too bad. 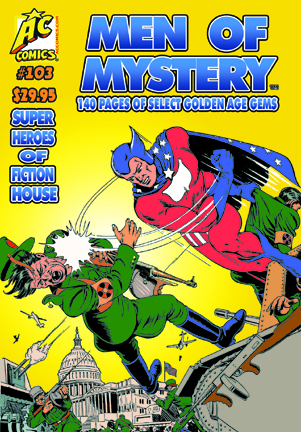 This go-around, issue #103; Men of Mystery shines a spotlight on the little-known roster of Fiction House superheroes. Ever hear of CAPTAIN FIGHT? Well, you’ll see him in a feature-length adventure originally published in Fight Comics #18, nicely illustrated by Artie Saaf. How about Rip Reagan, POWER MAN? FC’s entry in the “let’s imitate Superman” was drawn by Emil Gershwin. See it here. Intrigued by a star-spangled champion from the 29Th century traveling back in time to 1940 to fight Facsism? Try SUPER AMERICAN, as rendered by FC’s awesome cover specialist Dan Zolnerowich. Maybe your tastes run to a red-costumed spaceman who can grow to giant size. If so, check out The RED COMET, out of the early pages of Planet Comics. Rollicking action and adventure with an aviation backdrop is anything but routine with The PHANTOM FALCON. He actually had no super powers, but he did have a cool mask and costume, and actually appeared in Wings Comics until almost 1950. MOM #103 sports not one but TWO PF tales, one drawn by Howard Larsen, and one by Charles Sultan. And do make sure you are well-grounded when you check out The LIGHTNING, U. S. Army serviceman Fred Larkin in his red and yellow costume, tossing lightning bolts from his fingertips. This one illustrated by Sheena’s main artist, Robert Hayward Webb. Who would go around in a red cape and tights practicing magic in the jungle? TABU, that’s who. He stalked through a healthy run of issues of Jungle Comics, nicely rendered by Enrico Bagnoli, among others. Don’t forget a trio of costumed kids fighting enemy fifth-columnists on the domestic front known as The RANGERS of FREEDOM. Unfortunately, they only appeared in a quartet of adventures, all well-drawn (as is this one) by Joe Doolin. How much need could there be for costumed crimefighters in the African jungle in the 1940’s? Well, maybe more than we would think, since Jungle Comics also hosted the cowled RED PANTHER. See him here, drawn by Tom Gill. All of the above-mentioned rarities would be worth the price of admission alone, but there’s more- AURO, Lord Of Jupiter drawn by Bob Powell, STUART TAYLOR by Nick Cardy, Al Walker’s NORGE BENSON, CAPTAIN NELSON COLE, of the Solar Force; and FLINT BAKER by Arthur Peddy. Check out the Heroes of Fiction House in Men of Mystery #103, because you WON’T see THIS stuff anywhere else!! 136 pages, black and white with color covers, standard comic book size. Printed in 2017.